Lakewood is a city of homes and we love them dearly. They might be old, the toilet in the basement might leak a little, and the porch might be a little spongy in the middle. But we can agree that one of the badges of honor we all wear on our collective sleeve is the pride we have in our homes. Lakewood has moved into its second century and it is more important than ever to ensure our homes are healthy and safe. More than 80% of all Lakewood’s homes were built before 1935. Our aging housing stock has a lot of charm and character, but with that comes higher costs for repairs and improvements. But it’s not just about homes. It’s about the people who live here. LakewoodAlive’s Housing Outreach Program, led by Housing Outreach Director Allison Urbanek, seeks to work with residents to ensure everyone lives in healthy and safe housing. Our homes need to maintain their value, their curb appeal for the neighborhood, and their ability to fill you with pride as a great place to make your home. We also need to ensure our residents have access to the knowledge, resources and tools to keep those homes healthy and safe while combating disinvestment and fostering vibrant neighborhoods. Take our friend George who has lived on Plover Street in Birdtown for over 60 years. LakewoodAlive didn’t know George before our Community Engagement Program began in 2015. Around that time, our Engager Mark McNamara was tasked with knocking on doors in Birdtown with a goal of meeting residents and making every attempt to connect folks to resources to improve their quality of life. George is homebound and has significant health issues and like many seniors, he is on a fixed income. He likes to sit on his front porch and wave at passersby and learn about what’s happening around town. He can fondly recall the days of the candy shop that was across the street and the butcher down the block when Birdtown had stores in front of, or built into, homes. When Mark met George, he learned that his furnace wasn’t working well and the house was drafty. The exterior paint was peeling. The tree in the front yard was causing service issues from the utility lines that run from a nearby pole. And his garden, all 3’ x 12’ of it facing Plover Street, left much to be desired. Enter LakewoodAlive. We brought together the resources at our disposal and tackled each issue, one by one. Through our partnership with the Cleveland Housing Network, we were able to provide him with a new furnace and insulation through Dominion’s Weatherization Program. Our Paint Program, supported by the City of Lakewood and federal Community Development Block Grant funding, helped provide the paint and supplies. 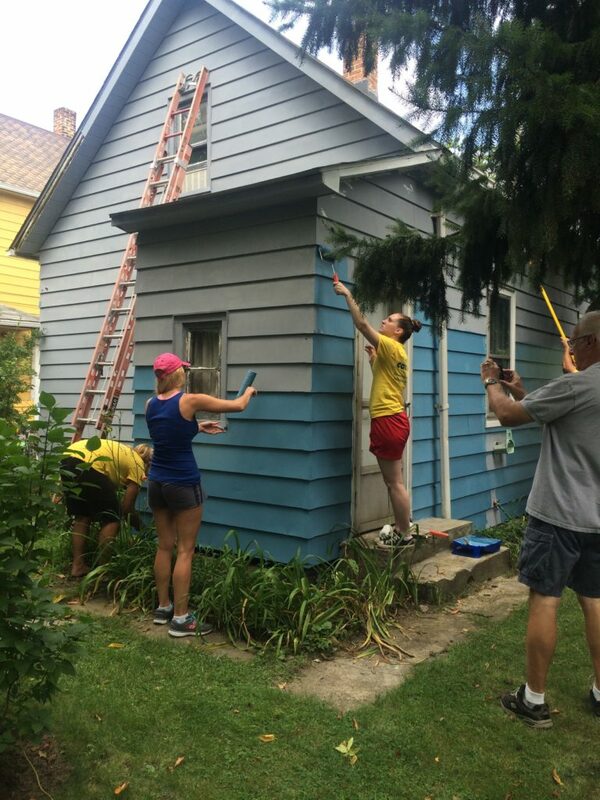 Cox Communications supplied volunteer labor to paint the house. 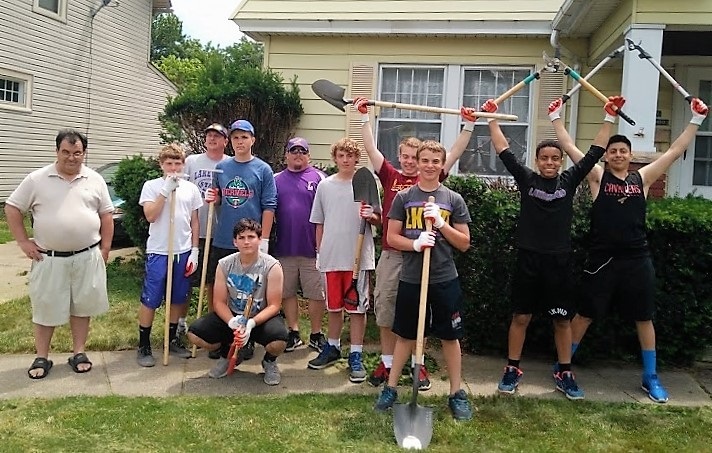 LakewoodAlive also partnered with St. Edward High School for a neighborhood beautification day that saw more than 80 students and parents help improve five properties in the neighborhood, including George’s tiny front yard garden. Cox Communications then offered to pay a tree service removal company to take out the pine tree that was partially dead. One year later, George found himself without a working washing machine. LakewoodAlive put out a call to board members, donors and volunteers. Within a few days, we had the funds for 75% of the cost of a basic washing machine. 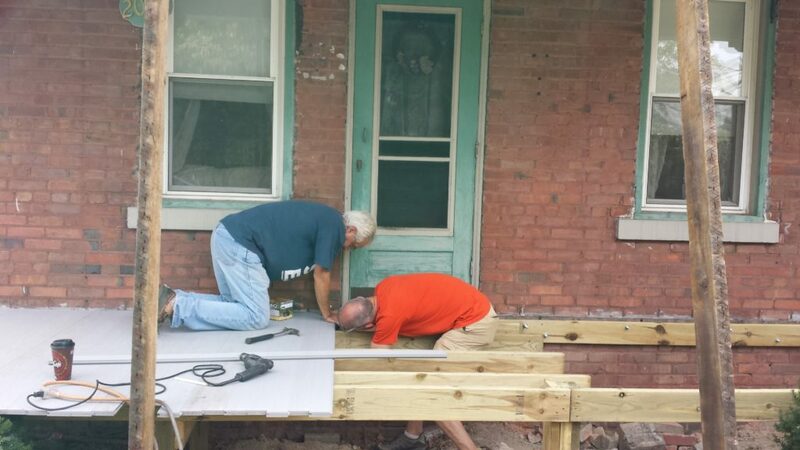 LakewoodAlive was able to cover the balance by using its 80/20 Program, whereby we put up 80% of the costs of a repair or critical need and the homeowner provides 20%. Today, George has a working washing machine, clean clothes and a beaming sense of pride. We are the cheerleaders who provide a service to the community that augments the lengths that government can go and that the private market won’t support. This middle ground is where we make impactful improvements in our community. We don’t solve every problem and we can’t help everyone but we always try to come to a resolution. Our goal is to educate and empower residents. In its fourth year, the free Knowing Your Home Series provides workshops that help folks of all income levels learn how to maintain and improve their home. Wet basement, leaking roof, leaning garage, or curb appeal: we design workshops that will meet the needs of our aging housing stock. None of this happens without the support of the City of Lakewood through partnership with multiple offices at City Hall; through access to Community Development Block Grant funding; and through collaboration to comprehensively tackle difficult properties in ways that can leverage our strengths. We also receive support from financial institutions, most notably First Federal Lakewood. Their commitment to LakewoodAlive, particularly the Housing Outreach Program, is incredible and allows us to be flexible and nimble when utilizing private funds to support our community. Do you know a neighbor that may need help? Or do you have a question about a project or improvement in your home? Contact our Housing Outreach Director Allison Urbanek at 216-521-0655 or aurbanek@lakewoodalive.org. She is more than happy to talk through the situation and determine next steps.